Foscue Creek Campground, Demopolis AL - Foscue Creek Campground is one of my favorite campgrounds. I stopped here 3 weeks in the winter of 2007 and again for a couple of weeks in 2008. There are numerous sites overlooking the inlets off Demopolis Lake on the Tombigbee River. Towboats to watch pass by on the river. Lots of aquatic birds. Turtles. Burro Creek Campground south of Wikieup AZ - Burro Creek Campground is a BLM Recreation Site along Burro Creek just off US 93 a few miles southeast of Wikieup AZ and 60 miles northwest of Wickensburg AZ. Casino del Sol, 5655 West Valencia Rd, Tucson AZ - Casino del Sol in Tucson AZ allows overnight RV parking in their large lot. Cave Creek Regional Park, Cave Creek AZ - Cave Creek Regional Park is a busy new RV park and recreational area near Cave Creek AZ. Clear Creek Campground east of Camp Verde AZ - Clear Creek Campground is a small, older, developed campground in the Coconino National Forest off Route 260 a few miles east of Camp Verde AZ. Davis Camp Park, Bullhead City AZ - Davis Camp Park is a large recreation park on the banks of Colorado River just north of the bridge over the river connecting Bullhead City and Laughlin NV. White Spar Family Campground, Prescott AZ - White Spar Family Campground is in the Prescott National Forest on AZ 89 just south of Prescott, Arizona. Mule Creek Road East of Guthrie AZ - There are some good spots to boondock along Mule Creek Road (AZ 78) in the Apache - Sitgreaves National Forest between Guthrie AZ and the New Mexico border. Up at the New Mexico border is a nice level rest area that also makes a good spot to overnight. BLM, Plomosa Road, Quartzsite AZ - The US Bureau of Land Management allows dispersed camping on much of the lands along Plomosa Road which leaves Route 95 a few miles north of Quartzsite AZ. Point of Rocks Campground, Prescott AZ - Point of Rocks Campground is a nice older RV park nestled amongst the rocks just north of the Watson Lake in the Granite Dells on the north side of Prescott AZ. Strayhorse Campground on US 191 south of Alpine AZ - In addition to the informal camping along US 191 south of Alpine AZ there is the nice little Strayhorse Campground on a saddle at a major trailhead, the first wide spot in the road south of Blue Vista overlook. Sewemup Mesa Canyon, Gateway CO - Sewemup Mesa Canyon is a limited, rough, but picturesque boondocking site along the BLM primitive road into the canyon below Sewemup Mesa, a half mile off CO Rt 141 about 10 miles south of Gateway CO.
Wilderness Rendezvous RV Park, Meeker CO - Wilderness Rendezvous RV Park is a new, bare bones - no frills, automated, RV park in Meeker CO.
Timberview Lakes Campground, Bushnell IL - This is an older park, located a couple miles north of Bushnell off Highway 9, now used primarily by long term campers. Buck Creek Campground, Rathbun Lake, Centerville IA - Buck Creek is located at beautiful Rathbun Lake, also known as Iowa's Ocean. Just 4.5 miles southwest of Moravia and 9 miles northwest of Centerville, the campground offers 42 electric campsites, 1 group picnic shelter, showers, restrooms, and dump stations located in the park. Activities include camping, fishing, boating, and swimming. A marina and a bait shop are located nearby. Nodaway Valley Park, Clarinda IA - This older 164 acre park, located 2 miles north of Clarinda on Highway 71, is on a hill overlooking the Nodaway and East Nodaway Rivers. It has an extensive trail system, 14 electrical campsites, picnic areas and a playing field in upland timber and open fields. Rough River State Park, Falls of Rough KY - Rough River State Park is a small park located at the foot of the Rough River Reservoir dam. TMost sites offer 30 AMP electric and water. There is a dump station and nice facilities with a small laundry. Walnut Meadow RV Park, Berea KY - Rough River State Park is a small park located at the foot of the Rough River Reservoir dam. TMost sites offer 30 AMP electric and water. There is a dump station and nice facilities with a small laundry. Gum Springs Campground - Winnfield LA - Gum Springs is a primitive campground in the Kisatchie National Forest on US 84 about 7 miles west of Winnfield LA. Twiltley Branch Campground, Collinsville MS - Twiltley Branch Campground is a nicely wooded campground on Okatibbee Lake, a large reservoir north of Meridian MS. It was practically deserted when I stopped here in December 2008 - just the way I like it. Freeman Community Club RV Park, Freeman MO - Freeman Community Club RV Park on MO Route 2, East of Freeman MO, offers 8 pullthrough campsites with 30/50 AMP electric, water and sewer for $15.00 per day and $10/day if longer than 7 days. Candy Cane RV Park & Campground, Steelville MO - Candy Cane RV Park & Campground on MO Route 8, west of Steelville MO, is a private park with 30 pullthrough campsites with 30/50 AMP electric, water and some with sewer. Meramec State Park, Sullivan MO - Meramec State Park is located south of Sullivan MO about 60 miles west of St Louis. The Missouri State Parks website introduces the park with: "The beauty of the Meramec River and its surrounding bluffs, caves and forests have pleased visitors since the park opened in 1927. In 1933, the craftsmen of the Civilian Conservation Corps began blending a variety of visitor facilities into the park's rugged landscape." DLD State Recreation Area, Hastings NE - DLD State Recreation Area in an old abandoned roadside recreation area along Rt 6 a few miles east of Hastings NE. Boulder Beach Campground, Lake Mead Recreation Area, Boulder City NV - Boulder Beach Campground is a Lake Mead National Recreation Area campground on the shore of Lake Mead just west of Hoover Dam. Canyon Trail RV Park, Boulder City NV - Canyon Trail RV Park is a nice clean operation in Boulder City NV. Echo Bay Lower Campground, Overton Arm, Lake Mead Recreation Area, Lake Mead NV - Echo Bay Lower Campground is a Lake Mead National Recreation Area campground on the shore of Lake Mead southeast of Valley of Fire State Park toward the northern end of Lake Mead. Harrah's Convenience Store RV Parking, Laughlin NV - Harrah's Casino in Laughlin NV offers overnight RV parking in the lot south of their convenience store across the highway from the casino. Sam's Town Casino RV Park, Las Vegas NV - Sam's Town Casino RV Park is a clean operation adjacent to Sam's Town Casino on Boulder Highway in Las Vegas NV. Green Valley Ranch Resort, Spa and Casino, Henderson NV - Green Valley Ranch Resort, Spa and Casino is located at 2300 Paseo Verde Parkway in Henderson NV. Ghost Ranch Campground, Abiquiu NM - The campground at Ghost Ranch Conference Center is a small campground with full hookups primarily serving activities at Ghost Ranch. Valley of Fires Recreation Area, Carrizozo NM - Valley of Fires recreation area is located immediately adjacent to the Malpais Lava Flow. Approximately 5,000 years ago, Little Black Peak erupted and flowed 44 miles into the Tularosa Basin, filling the basin with molten rock. The recreation area has 19 campsites with picnic shelters, tables, grills, and potable water at each site. Image: Valley of Fires campground looking north from site 15, April 27, 2009. Bottomless Lakes State Park, Roswell NM - Bottomless Lakes State Park, New Mexico's first state park, is a few miles east of Roswell. City of Rocks State Park, Faywood NM - City of Rocks State Park is a uniquely interesting park in a weathered and sculpted pile of volcanic rocks about 30 miles northwest of Deming NM. Elephant Butte Lake State Park, Elephant Butte NM - Elephant Butte Lake State Park is located on the shore of New Mexico's largest lake a few miles north of Truth or Consequences NM. BLM Campground, El Malpais National Conservation Area, Grants NM - El Malpais, NCA offers free, primitive camping at the Joe Skeen Campground (11 miles south on 117, from exit 89 on I-40 and 2 miles south of the BLM Ranger Station). Image: Camped at BLM Campground, El Malpais National Conservation Area, Grants NM, March 24, 2011. Leasburg Dam State Park, Radium Springs NM - Leasburg Dam State Park in Radium Springs NM is about 15 miles north of Las Cruces NM. LoW-HI RV Ranch, Deming NM - LoW-HI RV Ranch is a spacious 65-site RV park and is the headquarters for Loners on Wheels, Inc., a 40 year old singles club and is open to the public. Oliver Lee Memorial State Park, Alamogordo NM - Oliver Lee Memorial State Park is a few miles south of Alamogordo NM. Pancho Villa State Park, Columbus NM - Pancho Villa State Park in Columbus NM is about 30 miles south of Deming NM and just north of the border at Palomas, a popular destination for those looking for inexpensive medical and dental work in Mexico. Or a fine lunch at the Pink Store right over the border. Percha Dam State Park, Arrey NM - Percha Dam State Park in Arrey NM is about 60 miles north of Las Cruces NM. Rockhound State Park, Deming NM - Rockhound State Park is about 13 miles southeast of Deming NM. Santa Rosa Lake State Park, Santa Rosa NM - Santa Rosa Lake State Park is located on the shores of a Pecos River Reservoir about 7 miles north of Santa Rosa NM. This park offers quiet camping among the junipers and boating and fishing in the reservoir. Primitive Campground at Fort Stanton Cave, Lincoln NM - This little, 3 site, primitive campground is at the entrance to the Fort Stanton Cave in the new Fort Stanton-Snowy River Cave National Conservation Area off US 380 west of Lincoln NM. This Conservation Area was established in 2009 to protect and conserve the unique and nationally important subterranean cave resources of the Fort Stanton - Snowy River cave system. Snowy River is a significant passage within Fort Stanton Cave. This campground primarily serves those who have been issued a permit to enter the cave. Image: Fort Stanton Cave Campground, December 18, 2009. 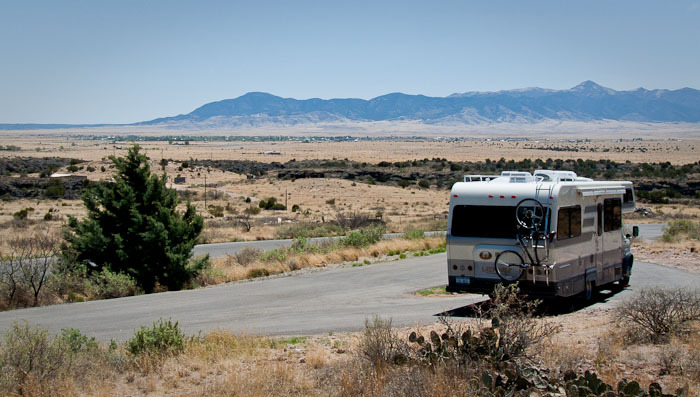 Bosque Bird Watcher's RV Park, San Antonio NM - Bosque Bird Watcher's RV Park is a small mom & pop operation on the west side of NM 1 the south end of San Antonio, New Mexico offering basic gravel parking lot type sites with full hookups. It's nothing fancy but is quiet and clean and handy to the Bosque del Apache National Wildlife Refuge. Hidden Valley RV Park, Tijeras NM - Hidden Valley RV Park is an older 100 site park on a wooded hillside off NM 333 just east of Tijeras, New Mexico with basic gravel sites and full hookups. It's nothing fancy but is quiet and clean and handy to Albuquerque. Cactus RV Park, Tucumcari NM - Cactus RV Park is an old 40 site park along the now dilapidated Historic Route 66 frontage in Tucumcari New Mexico with basic gravel sites and full hookups. It's nothing fancy but is quiet and clean and handy to a decent restaurant and the Dinosaur Museum. Clayton Lake State Park, Clayton NM - Clayton Lake State Park is on a man made reservoir about 12 miles north of Clayton NM. Ute Lake State Park, Logan NM - Ute Lake State Park is located on the shores of a Canadian River Reservoir in Logan NM which is on US 54 about 25 miles north of Tucumcari NM. NOTE: See Andy Baird's New Mexico State Parks web app for a comprehensive list of NM State Parks. The Home Place, Red Rock, East Chatham NY - This is my old home place, the farm I grew up on, the place I left to begin these winter journeys to the southwest. Susquehanna Trail Campground, Oneonta NY - Susquehanna Trail Campground is right in the middle of the beautiful rolling hills near the Susquehanna River. If sightseeing is your thing the campsite is close to many of the areas greatest attractions; a half mile from the Soccer Hall of Fame, two miles from Cooperstown All-star Village, and 25 miles from the Baseball Hall of Fame. Twin Bridges State Park, Fairland OK - Twin Bridges State Park is located on US60 east of Fairland OK. StateParks.com website introduces the park with: "Twin Bridges State Park offers fabulous fishing in a beautiful country setting. Whether you stay in a lake hut or camp under the stars, you'll find plenty of reasons to love this park. Twin Bridges State Park is known for its quiet country atmosphere and excellent fishing for trophy-sized bass, catfish, bluegill and spoonbill. A fishing center with bait/tackle, snacks and enclosed fishing dock is located within the park. Lighted boat ramps, picnic facilities, RV and tent campgrounds, lake huts, playgrounds, volleyball court and horseshoe pits are also available." Sideling Hill Service Plaza, Waterfall PA - Sideling Hill Service Plaza is located at milepost 172.3 on the Pennsylvania Turnpike, at about the midpoint of the Turnpike. It's a nice clean modern travel plaza with ample parking. There's even a Farmer's Market here. Oh, and an RV dump station. Davis Mountains State Park Campground, Fort Davis TX - I like the campground in the Davis Mountains State Park and its convenience to the McDonald Observatory a few miles up the road. Pine Springs Campground - Guadalupe Mountains National Park, Salt Flat TX - Located just off U.S. Highway 62/180 near the Headquarters Visitor Center, Pine Springs Campground is a simple, desert camping area situated at the base of the mountain. Lake Meredith National Recreation Area, Fritch TX - Lake Meredith National Recreation Area is located on the shores of a Canadian River Reservoir near Fritch TX north of Amarillo TX. North Campground, Bryce Canyon National Park, Bryce UT - North Campground is at the north end of Bryce Canyon National Park across from the Visitor Center. Bryce Canyon National Park has two campgrounds, North and Sunset, located in close proximity to the visitor center, Bryce Canyon Lodge and the geologic wonder that is the Bryce Amphitheater. Both have restrooms with flush toilets, and drinking water. During the summer months coin-operated laundry and shower facilities are available at the general store nearby. There are no hook-ups in the campgrounds, but a fee-for-use dump station is available for RV users at the south end of North Campground. Devil's Canyon Campground, Blanding UT - Devil's Canyon Campground is a new US Forest Service campground about midway between Blanding and Monticello UT. There are no services available at the sites. Utah Route 12 East of Escalante UT - There are some good spots to boondock in the Grand Staircase - Escalante National Monument along Utah Route 12 between Escalante and Boulder. This spot is on the ridge west of Spencer Flat Road and overlooks Escalante to the west and Escalante Canyons to the east. Primitive Campground West of Rt 95 Bridge over Lake Powell. - This is a Glen Canyon National Recreation Area primitive roadside camping area overlooking the north end of Lake Powell just west of the Route 95 bridge over the lake at Hite UT. Recapture Dam Recreation Area, Blanding UT - Recapture Dam Recreation Area, a few miles north of Blanding UT has a few spots at the small boat launch beaches either side of the lake that make reasonable boondocking sites for small RVs. There are no services available at the sites. Trailhead to Jacob's Chair, Fry Canyon UT - This camp is in the parking area along Rt 95 overlooking the White Canyon crossing of the off road vehicle trail to Jacob's Chair about ten miles west of Fry Canyon Utah. Zion Canyon RV Resort, Springdale UT - Zion Canyon RV Resort is on the Virgin River south of the Zion Canyon Visitor Center. South Campground, Zion National Park, Springdale UT - South Campground is on the Virgin River just north of the Zion Canyon Visitor Center. Campgrounds in Zion Canyon have restrooms, drinking water, picnic tables, fire grates, and dump stations. All sites are half price for holders of Interagency Senior and Access Passes. There are no showers available within Zion National Park. Pay showers are available in Springdale and east of the park. The availability of these services varies throughout the year. Cottonwood Campground, Alcova Reservoir, Alcova WY - Cottonwood Campground is a Natrona County park with some shelters, a boat launch ramp, and some campsites with no services. There is a dramatic view of the reservoir from most sites. Dugway Ramp Recreation Area, Sinclair WY - Dugway Ramp Recreation Area is a BLM primitive day use area and campground on the North Platte River at the Dugway Ramp North Platte River rafting access a few miles north of Sinclair WY along the road to Seminoe Reservoir. Walmart Parking - One thing that makes this mobile life economical is Walmart's willingness to allow RVers to park in their lots overnight. Here are some Walmarts I've overnighted at.